Schnappers I’m back from my South East Asia adventure however am saddened to report that not ALL of me is back. 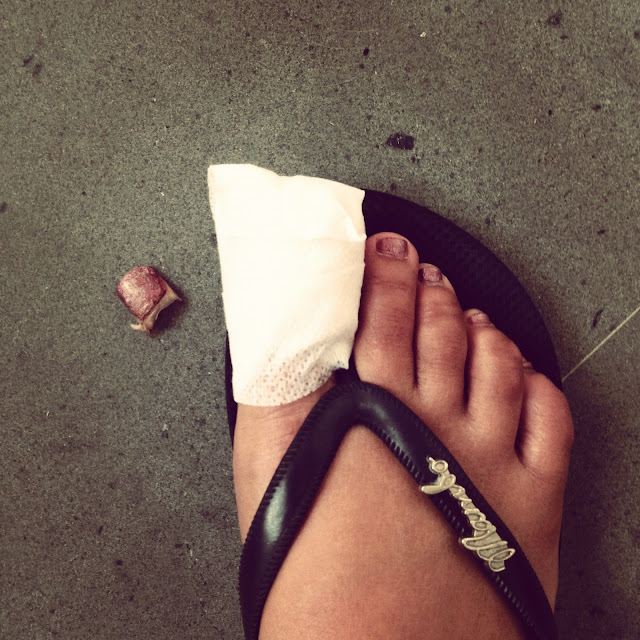 Following a mishap while white water rafting in Ubud, Bali I half ripped out my big toe nail! Considering how gross it looks it did not hurt much more than a regular toe stubbing and I managed to sit through a further 2 hours of rafting (including rapids, a 4 meter waterfall and collisions with many a boulder) before going to hospital. That’s where the pain really started. The doctor tried numbing my toe up with some anaesthetic injections which she applied in a similar way I would use say a spoon to mix cake batter. After 4-5 of these excruciating needles it appeared that aside from making me scream like a banshee, they did absolutely nothing to numb up my toe. Well pain or no pain the nail had to go so with the assistance of a nurse to pin me down the doctor proceeded to peel and pull off my toe nail. I felt like I was in some sicko horror movie scene. So this little piggy went to market and doesn’t look like he’ll be back anytime soon, if at all. Even worse I can’t do two of my most favouritest things; 1. Wear ridiculously high shoes (or any shoe for that matter) 2. Go to the gym. Needless to say I am a bit sulky and miserable. Other than that the rest of my trip was amazing and I’ll post a photo travel journal soon. Fashion – Zara in Canberra? ?